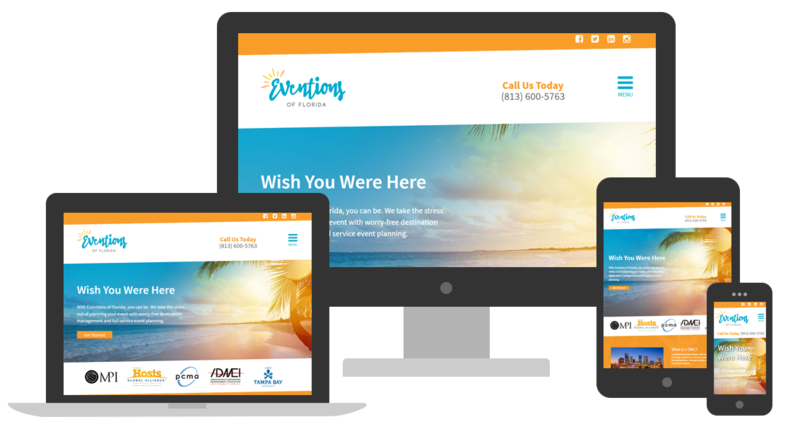 Eventions of Florida was entering their 10th anniversary and wanted to create a new brand and web presence that spoke to their specific clientele niche. They wanted a new brand and website presence that attracted their ideal clients for destination mangement, corporate incentive programs, and corporate and charity events in the Tampa Bay and Key West markets. The new logo created for Eventions of Florida is designed to extract an effervescent emotion accompanied by a "flowly" feeling meant to represent the finessee Eventions uses when planning an event. The sunrays are a nod to the company's Florida roots and exude an air of energy and excitement. The website is created with the same desired response: excitement, enthusiasm, and energy.